Meet Ed, the owner and manager of Hillywood Tree Nursery. The seed of the idea (pun intended!) to develop a wholesale tree nursery was first planted when Ed was a child. Some of his fondest childhood memories are of working in the garden and planting trees on his family’s farm. This eventually led Ed to complete a Bachelor of Horticulture (Hons) at the University of Melbourne. 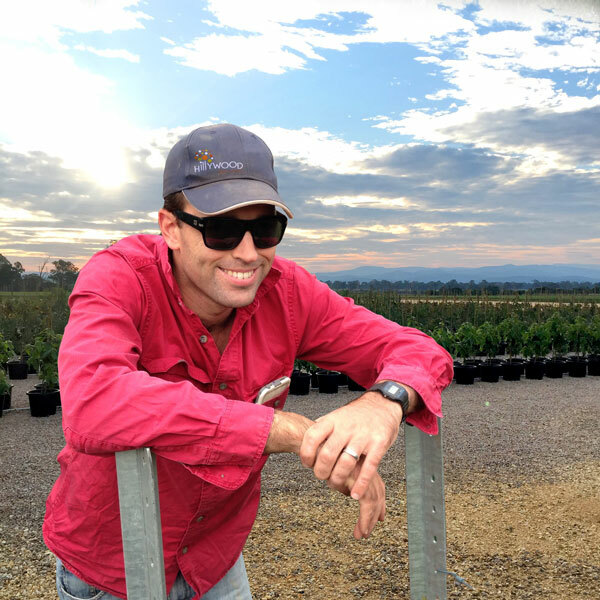 After gaining experience in various horticultural and agricultural industries, Ed started construction on Hillywood Tree Nursery in 2015 located on his family’s farm in Briagolong, Victoria. The farm is also home to a beef cattle business that is operated by Ed’s family. Both businesses are sustained by the Freestone Creek, which flows freely through the property and supplies fresh drinking water to the cattle and is used to irrigate the nursery. Ed is assisted at Hillywood Tree Nursery by his wife, Caitlin, and their faithful sidekick, Dex the dog. The name “Hillywood Tree Nursery” is inspired by the spectacular views of the Great Dividing Range, which can be seen from the nursery site.